Photo Credit: Claire Thomas, The Kitchy Kitchen, 2019. Myra Michelle, my friend since our middle school days, is the 5xs, great- granddaughter of one of France’s most famous authors, Alexandre Dumas (père) (1802-1870) , who wrote classics such as “The Three Muskateers” and “The Count of Monte Cristo“. He was also an exceptional cook and epicure. Dumas was a man of exquisite tastes, and at most, extravagant, even by modern standards. His social circles included the cafe society of mid 19th century Paris, and if your were a member of the literati, there was a good chance that you would have found yourself at one of Dumas’ weekly open houses where he was hosting one of his most lavishly grand dinner parties. With all his friends in attendance, they would be dazzled with the glorious foods he presented. A really surprisingly delicious ice cream, the creation of which is attributed to the famous French writer Alexandre Dumas, who not only confined his talent to many interesting books, known the world over, but also to a culinary book, the authoritative “Grand Dictionnaire de Cuisine” (The Great Culinary Dictionary) published by Alphonse Lemerre, in Paris in 1873. 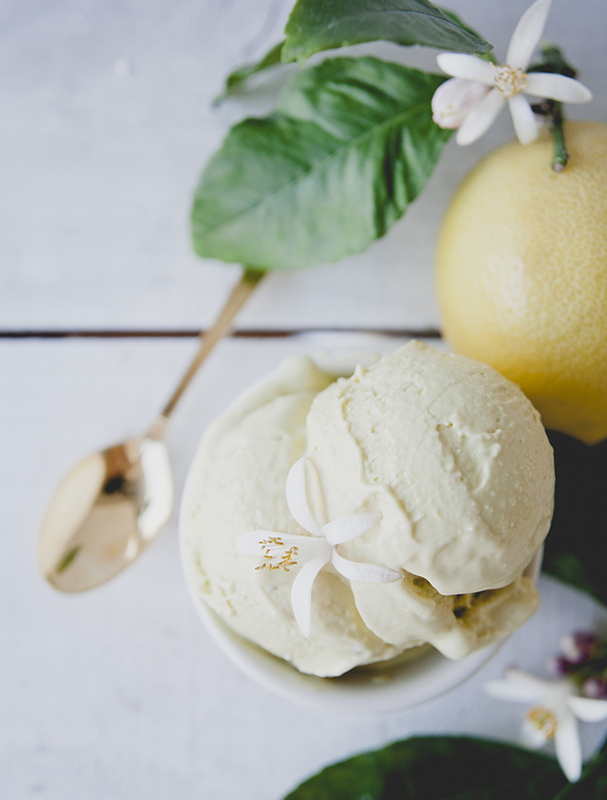 But I digress, the subject at hand was ice cream…..
Dumas’ lemon flower ice cream was served very often, at his Chateau de Bellevue, near Paris, France, where all the illustrious writers of his era would meet for the salons. The Chateau de Bellevue, also known as is a charming castle located in France, on Port-Marly hill, between Marly-le-Roi and Saint-Germain-en-Laye. The castle is just as famous as the novel to which it owes its name. The story of the castle begins with the success of both of Dumas’ novels. At the height of his fame and seeking a peaceful place to continue his writing and escape the chaos of city life, Dumas acquired a vineyard just 12 miles (20km) to the west of Paris. In 1846, Dumas prepared plans for his future home with the help of notable architect Hippolyte Durand (1801-1882), a French architect who specialized in medieval-style church architecture. Durand restored or built many church buildings, mostly in the southwest of the country. He is perhaps best known for the Basilica of Our Lady of the Immaculate Conception at Lourdes, completed in 1872. Durand is also know for his renovations to the Basilique Saint-Rémi in Reims. Dumas’ plans for the estate included a Renaissance château, a miniature Gothic castle, and gardens featuring waterfalls, ornamental rocks, and grottos. On the 25th of July 1847, Dumas organized a party for his friends and admirers and moved into his tiny earthly paradise, as he referred to the estate. Chateau de Bellevue, the main building. The first floor features what is undoubtedly the most beautiful room in the castle: the Moorish Salon based on Dumas extensive travels to Spain and North Africa.. It has authentic decor, with blue and red stained-glass windows, and white, green, and blue tiles. The walls are adorned with arabesques and fine stucco sculptures crafted by Beiluli Tunisian artisans. The first floor also features the bedroom, library, and dressing room. On the ground floor there is the dining room where meals were served even by the writer, the rooms that hosted fabulous parties, where they were welcomed friends and were consumed with love stories. Life at the castle was also animated by the multitude of pets, along with dogs and cats, and there was a menagerie including parrots, monkeys and an eagle. Alexandre Dumas’ study is separated from the castle and it is the place where he would retreat to write. The Château d’If, as Dumas named it, is a delightful tiny neo-gothic castle, whose facades are carved with titles of his work. A sculpture of a dog in a niche decorates the stairs leading up to the Château d’If. All 88 of Dumas are carved in stone on the façade of the Château d’If. The park includes a garden in English style planted with varieties of roses and trees, such as fir, larch, oak, birch, hornbeam, and lime trees. Dumas’ home was also full of pets, among which fourteen dogs and cats. The estate also included a ménagerie with both familiar and rare animal species that Dumas brought with him from his travels, including monkeys, parrots, and a vulture. The life of Dumas at The Chateau de Bellevue was anything but boring. He loved to entertain and organized large, extravagant parties. However, Dumas was heavily in debt and eventually had to sell his personal paradise. On the 22nd of March 1849, he sold the property for the modest sum of 31,000 gold francs, although it had cost him hundreds of thousands to build. As leaving his beloved home was very difficult for Dumas, the buyer let him stay at The Chateau until he departed for Belgium in 1851. In the second half of the 19th century, the property passed through several owners before falling into disrepair. In 1969, a real estate project planned to build 400 new homes on the site. However, the Society of the Friends of Alexandre Dumas and the local authorities came together, bought the property and saved Monte-Cristo from demolition. Restoration followed, and even the King of Morocco, Hassan II, helped by financing the restoration of the famous Moorish Salon. Since 1994, the Château de Monte-Cristo has been a public history museum commemorating Dumas and a monument representing the Romantic architecture of the nineteenth century. Although Julia Child introduced the art of French Cooking to the modern housewife in America. The French influence in America cuisine has been present since the early colonial days. However, too often are chefs like François Vatel (1631 – 1671) and contributions like Dumas are overlooked. Sometimes, a little research will reveal little gems like this, an ice cream recipe from the 19th century! It is very easy to make, the basis being a plain custard as we close out this month of featuring Citrus Fruits. In a heavy sauce pot, scald heavy cream with the sugar and salt. Gradually and slowly, almost drop by drop, pour this hot cream over the slightly beaten egg yolks, beating rapidly and constantly from the bottom of the mixing bowl, to prevent the curdling on the eggs. Add the chopped lemon flowers with the last amount of scaled cream. On a medium high setting, cook the mixture over boiling water using a double boiler, until mixture is of a soft-custard like consistency, stirring constantly. Strain through a double cheesecloth or a fine sieve into bowl. Cover with plastic and allow to cool in the refrigerator. When cold, place the cream in an ice cream maker and freeze the cream according to the manufacturer’s directions. When the process is complete, transfer the ice cream into a lidded container and finish freezing in the freezer, for at least another 2 hours, for the desired consistency. Any kind of edible flower may be substituted for lemon flowers if desired. Please use this Edible Flower Chart before eating any flowers that you are not familiar with.